When Joel Greenwald, MD, counsels physicians on how to manage their money, they listen. But not just because he’s a successful financial planner who works exclusively with dentists and physicians. It’s because he truly has been there, done that. Greenwald, a physician turned certified financial planner, walked away from an 11-year medical career in internal medicine at age 40. And having practiced for more than a decade in the Twin Cities region of Minnesota, he was known in the community and known by his colleagues. But that doesn’t mean the transition to financial planning was an easy one. Greenwald was surrounded by physicians while growing up. His grandfather was a public health doctor, his grandmother was a cardiologist, and his father an oncologist. But he found himself both attracted to medicine yet certain when he entered college that he was not going to become a physician. Regardless, Greenwald enrolled in pre-med at Amherst College, then received his MD at the Albert Einstein College of Medicine. He met his wife during his residency at the University of Minnesota. He thought they would be a two-physician household, but there were issues. 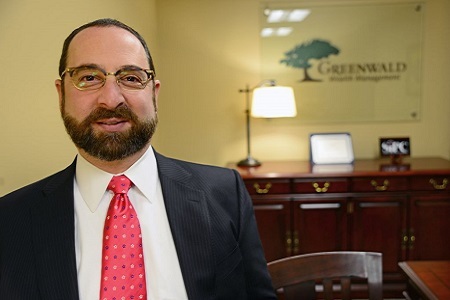 Greenwald began studying to become a certified financial planner. And the more he pursued the career change, the more he enjoyed it. At age 38, Greenwald began splitting his week – three days working as a physician, two days as a financial planner at Raymond James. But he knew that he could only do one of them successfully. Two years later he became a full-time financial planner – but the transition was fraught with challenges. Greenwald explains that when you study medicine, you learn the craft, open a practice, and are flooded with patients. He says many primary care physicians in Minnesota have closed practices because they can’t accommodate all the patients who want to see them. That’s not the case when you become a financial planner. Greenwald took the six courses and exam to become a certified financial planner, but found nobody was banging down his door to see him. Greenwald says he has more respect for physicians today than when he was one himself. He says physicians know the work is challenging, but they don’t necessarily realize that while they’re working at their craft. He equates it to some degree to being an NBA basketball player. It’s what you’re good at; what you’ve always been good at. And you likely don’t stop and realize you’re one of perhaps 300 people in the world who are that good. As for working with physician clients, Greenwald says there are two kinds. Some do not want to be at all involved in the financial planning process. They don’t care to understand; they just want Greenwald to take care of things for them. Then there are those who are naturally inquisitive; have an intellectual curiosity, which is part of what makes them good physicians. They want to look under the hood and see what’s going on, Greenwald says. But never in a negative fashion. “It’s more, ‘Why are we doing this? Okay, that makes sense,’” he says. Greenwald says he has spent the last 18 years devoted to his children. He has two in college and a 13-year old at home. He’s the parent with the primary responsibility for much of the work that goes into raising the children, such as getting them to after-school activities and attending parent-teacher conferences. In short, he has been the soccer mom.